As the founder of Miami's track program, Lloyd Bennett literally had to build the program from the ground up. 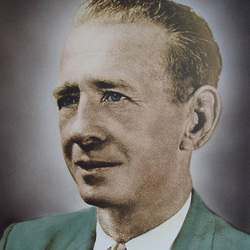 Over the span of 13 years as Head Coach, starting in 1945, Bennett compiled a record of 23-17. However, track is far from the end of the legacy of Lloyd Bennett. While he may not have founded Miami's swimming program, Bennett was certainly instrumental in laying the ground-work for the success the program enjoys today. Bennett was the team's third coach ever and only the second since World War II. In the 19 years he coached the team, Bennett had 12 winning seasons, and won the Southern Intercollegiate Championship in 1966. Throughout the combined 32 years Bennett coached at Miami, his teams were characterized by a never-say-die attitude, and a "commitment to excellence" that has become a staple for all Hurricanes Athletics. Lloyd Bennett passed away in 1978 and is survived by his wife Mary Louise, his sons John and Robert Bennett, and his daughter Jane Bennett Duval.